This wikibook is about Seismic fitness (or Seismic sustainability) which stands for ability of buildings or civil engineering structures to perform their basic operational functions with seismic risk limited to acceptable level. Seismic fitness may be considered the paramount goal of earthquake engineering which is concerned with protecting society, the natural and the man-made environment from the earthquake hazards. Shake-table testing of a regular building model (left) vs. base-isolated one (right). Rescue team search over Japan after the March 25, 2011 earthquake and tsunami. For any particular structural object and earth shaking intensity, seismic fitness is not universal. It depends on a particular type of challenge: e.g., the soil conditions, 3-D directions of shaking, possibility of tsunami and its magnitude, etc. A seismically fit structure does not necessarily have to be extremely strong or expensive. It just has to withstand the seismic effects while sustaining an acceptable level of damage. The most powerful and budgetary tools for upgrading seismic fitness of buildings and structures are vibration control technologies and, in particular, base isolation. 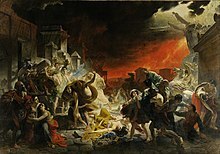 The last Day of Pompeii by Karl Briullov. Ancient builders believed that earthquakes were a result of wrath of gods (e.g., in Greek mythology, the main "Earth-Shaker" was Poseidon) and, therefore, could not be resisted by humans. As knowledge of engineering has improved, however, architects and engineers have become better at building structures with proper seismic performance. Earthquake simulations have been widely used in the research supported by The George E. Brown Network for Earthquake Engineering Simulation (NEES). Seismic performance is an execution of a structure's ability to sustain its due functions, such as safety and serviceability, at and after a particular earthquake exposure. A structure is, normally, considered safe if it does not endanger the lives and wellbeing of those in or around it by partially or completely collapsing. A structure may be considered serviceable if it is able to fulfill its operational functions for which it was designed. Basic concepts of the earthquake engineering, implemented in the major building codes, assume that a building should survive The Big One (the most powerful anticipated earthquake) though with partial destruction. Drawing an analogy with a human body, it will have dislocated joints, fractured ribs, traumatized spine and knocked out teeth but be alive and, therefore, quite O.K. according to the prescriptive building codes. This situation is a major barrier to implementation of any structural innovations in the earthquake engineering technologies employing the seismic vibration control and, particularly, the most effective brands of base isolation. Adjacent buildings in Niigata, Japan demonstrate different seismic fitness (1964). However, alternative performance-based design approaches already exist and are implemented at earthquake engineering research. Some of them, for assessment or comparison of the anticipated seismic performance or for seismic performance analysis, use the Story Performance Rating R as a major criterion  while the Seismic Performance Ratio (SPR) is used for a rather accurate prediction of seismic performance of a building up to the point of its state of severe damage . Anyway, replacement of the present prescriptive design standards with the future codes of performance is not an easy task: most of the designers would be reluctant to accept any additional legal obligations. Seismic or earthquake performance evaluation is a formal procedure to quantify the level of actual or anticipated seimic performance associated with the direct damage to an individual building subject to a specified ground shaking. A chart of concurrent computational testing of two 12-story building models. The best way to do it is to put a model that simulates the building structure on a shake-table that simulates the earth shaking and to watch what may happen next (if you have no time to stand out in the field and wait for a real earthquake to strike, which is called a field testing). Such kinds of experiments were performed still more than a century ago. Another way is to evaluate the earthquake performance analytically. The very first earthquake simulations were performed by statically applying some horizontal inertia forces, based on scaled peak ground accelerations, to a mathematical model of a building. With the further development of computational technologies, static approaches began to give way to dynamic ones. Traditionally, numerical simulation and physical tests have been uncoupled and performed separately. So-called hybrid testing systems employ rapid, parallel analysis using both physical and computational tests . PrintScreens of concurrent computer models animations. Comparative shake-table testing of two models. Earthquake or seismic performance simulation is meant to study effect of earthquakes on building structures and is a practical way of seeing a thing to happen without it actually taking place in the same way. There are research institutions just devoted to earthquake performance simulations, like, e.g., The George E. Brown, Jr. Network for Earthquake Engineering Simulation or NEES. Another way is to evaluate the earthquake performance analytically. The very first earthquake simulations were performed by statically applying some horizontal inertia forces, based on scaled peak ground accelerations, to a mathematical model of a building. With the further development of computational technologies, statics approaches began to give way to dynamics ones . Seismic performance analysis is an intellectual tool of earthquake engineering which breaks the complex topic into smaller parts to gain a better understanding of seismic performance of building and non-building structures. The technique as a formal concept is a relatively recent development. In general, seismic analysis is based on the methods of structural dynamics. For decades, the most prominent instrument of seismic analysis has been the earthquake response spectrum method which, also, contributed to the proposed building code's concept of today . However, those response spectra are good, mostly, for single-degree-of-freedom structural systems. Numerical step-by-step integration, applied with the charts of seismic performance , proved to be a more effective method of performance analysis for the multi-degree-of-freedom structural systems with severe non-linearity and under a substantially transient process of earthquake type kinematic excitation or earthquake simulation  . Earthquake engineering research means both field and analytical investigation or experimentation intended for discovery and scientific explanation of earthquake engineering related facts, revision of conventional concepts in the light of new findings, and practical application of the developed theories. NEEShub presentation snapshot, Purdue University. The National Science Foundation (NSF) is the main United States government agency that supports fundamental research and education in all fields of earthquake engineering. In particular, it focuses on experimental, analytical, and computational research on design and performance enhancement of structural systems. The George E. Brown, Jr. Network for Earthquake Engineering Simulation or NEES is created by the National Science Foundation to give researchers the tools to learn how earthquakes and tsunamis impact buildings, bridges, utility systems and other critical components of civil infrastructure. A definitive list of earthquake engineering research related shake-tables around the world may be found in Experimental Facilities for Earthquake Engineering Simulation Worldwide. The most prominent of them is now E-Defense Shake Table in Japan. to absorb the resonant portions of the whole wave frequencies band with the help of so called tuned mass dampers . To increase the shielded range of forcing frequencies, the concept of Multi-Frequency Quieting Building System (MFQBS) was developed . For this, some pads are inserted into or under all major load-carrying elements in the base of the building which should substantially decouple a superstructure from its substructure resting on a shaking ground. The first evidence of earthquake protection by using the principle of base isolation was discovered in Pasargadae, a city in ancient Persia, now Iran: it goes back to VI century BC . Base isolation testing of two building models at CSUN. The right one is equipped with a base isolation device . Base isolation or seismic isolation is a collection of special units in a building resting on its foundation to provide separation of the building from the shaking ground thus improving its seismic performance . From the very beginning, the theory of base isolation rested on two pillars: heavy damping and frequency separation. Unfortunately, nobody paid any attention that the heavy damping was a sort of a strong connection between a substructure and superstructure, and that the idea of decoupling them with the help of such connections was of no good . Anyway, to virtually test-drive any design concept of base isolation, some online help is available now . Pasadena City Hall, California, U.S.
San Francisco City Hall, California, U.S.
Salt Lake City/County Building, Utah, U.S.
Antifriction and Multi-Step Base Isolation (AF&MS BI), also called Shock Evader, is relatively recent type of seismic vibration control. In spite of the fact that the first attempts to isolate buildings from potentially shaky ground were made thousands years ago, the modern concept of seismic isolation (flexible mounting + damping) is foreign for earthquake engineering: it has not been inherited, it has been borrowed from the mechanical engineering. ]Though the concept is working perfectly in all sorts of vehicles, in seismic isolation everything is not so smooth because the conditions in both cases are quite different. In a car, for instance, the working stresses in auto parts are far below their ultimate bearing capacity. Therefore, some overloads associated with heavy damping are of no practical importance here. Another matter is a building structure: during a strong earthquake, it is intended to perform at the near-to-collapse level and, therefore, any extras can become crucial for its safety. Let the earth move its way. Restore the structure in its pre-earthquake position on the foundation. It is not the building, it is the earth that should be vibrating if the building is supported on the ideal isolation system. Any attempt to reduce a relative displacement of the superstructure with respect to the base will inevitably result in additional transmission of earthquake energy into the building. This new concept has been embodied in Shock Evader or, which is the same, in the Antifriction and Multi-Step Base Isolation (AF&MS BI) that incorporated the merits of the traditional flexible mounting but without its drawback - a compulsory damping mechanism . 18-story model on earthquake protectors. Earthquake protector is a type of base isolation intended for protection of building and non-building structures against potentially damaging lateral impact of strong earthquakes . Heavy damping mechanism sometimes incorporated in vibration control technologies and, particularly, in base isolation devices, may be considered a valuable source of suppressing vibrations thus enhancing a building's seismic performance. However, for the very pliant systems such as base isolated structures, with a relatively low bearing stiffness but with an high damping, the so-called "damping force" may turn out the main pushing force at a strong earthquake . This finding created a theoretical ground in earthquake engineering for a damping-disengaged base isolation technology called Earthquake protector . Shake-table testing of a 6-story building model placed on an earthquake protector. A shake-table video of concurrent shake-table experiments with two identical and kinematically equivalent to their 12-story prototype building models is presented at . The right model there rests on Earthquake Protectors, while the left one, caught at the time of its crash, is fixed to the shake-table platen. Analytical software called EPET or Earthquake Performance Evaluation Tool enables concurrent virtual experiments on the same building models with any sliding type of base isolation, including Earthquake protector, and without. Elevated building foundation (EBF) is a kind of seismic base isolation technology which is made a major part of a building superstructure . It is made to protect the building's superstructure against damage from the shaking caused by an earthquake. This goal can be met with the right building materials, size, and setup of EBF for the building site and local soil conditions. As a result of multiple wave reflections and diffractions, as well as energy dissipation of the seismic waves as they move up through the EBF, any movement of seismic wave energy into the building superstructure will be decreased, which will lower seismic loads and improve seismic performance of the structure . In other words, the building does not shake as much because it is sitting on the elevated building foundation, and will probably take less damage from the earthquake. Shake-table testing of Friction Pendulum Bearings. Earthquake-protective building buffer - exploded view. Simple roller bearing or Earthquake-protective building buffer  is a simplified version of a base isolation device called earthquake protector which is intended for protection of various building and non-building structures against potentially damaging lateral impacts of strong earthquakes. People of Inca civilization were masters of the polished dry-stone walls, called ashlar, where blocks of stone were cut to fit together tightly without any mortar. The Incas were among the best stone masons the world has ever seen , and many junctions in their masonry were so perfect that even blades of grass could not fit between the stones. Peru is a highly seismic land, and for centuries the mortar-free construction proved to be apparently more earthquake-resistant than using mortar. The stones of the dry-stone walls built by the Incas could move slightly and resettle without the walls collapsing which should be recognized as an ingenious passive vibration control technique employing both the principle of energy dissipation and that of suppressing resonant amplifications . Transamerica Pyramid building in San Francisco, CA. Building elevation control is a valuable source of vibration control of seismic loading. Thus, pyramid-shaped skyscrapers, continue to attract attention of architects and engineers because such structures promise a better stability against earthquakes and winds. Besides, the elevation configuration can prevent buildings' resonant amplifications due to the fact that a properly configured building disperses the shear wave energy between a wide range of frequencies. Earthquake or wind quieting ability of the elevation configuration is provided by a specific pattern of multiple reflections and transmissions of vertically propagating shear waves, which are generated by breakdowns into homogeneity of story layers, and a taper. Any abrupt changes of the propagating waves velocity result in a considerable dispersion of the wave energy between a wide ranges of frequencies thus preventing the resonant displacement amplifications in the building. Tapered profile of a building is not a compulsory feature of this method of structural control. A similar resonance preventing effect can be also obtained by a proper tapering of other characteristics of a building structure, namely, its mass and stiffness . As a result, the building elevation configuration techniques permit an architectural design that may be both attractive and functional. When seismic waves start to penetrate a base of building structure, seismic dampers can decrease their damaging effect and improve the building's seismic performance . Lead Rubber Bearing or LRB is a hybrid of base isolation employing a property of heavy seismic damper. It was invented by William Robinson, a New Zealander. Heavy damping mechanism incorporated in vibration control technologies and, particularly, in base isolation devices, is often considered a valuable source of suppressing vibrations thus enhancing a building's seismic performance. However, for the rather pliant systems such as base isolated structures, with a relatively low bearing stiffness but with a high damping, the so-called "damping force" may turn out the main pushing force at a strong earthquake. The video  shows a Lead Rubber Bearing being tested at the UCSD Caltrans-SRMD facility. The bearing is made of rubber with a lead core. It was a uniaxial test in which the bearing was also under a full structure load. Many buildings and bridges, both in New Zealand and elsewhere, are protected with lead dampers and lead and rubber bearings. One of two three-story town-houses like this, which was well instrumented for recording of both vertical and horizontal accelerations on its floors and the ground, has hardly survived a severe shaking during the 1994 Northridge earthquake and left valuable recorded information for the further study. In sense of average peak accelerations, the building performed at that time 21% worse than its non-isolated hypothetical counterpart. Tuned mass damper in Taipei 101. Typically, the tuned mass dampers, a kind of seismic vibration control technology , are huge concrete blocks mounted in skyscrapers or other structures and moved in opposition to the resonance frequency oscillations of the structures by means of some sort of spring mechanism. Taipei 101 skyscraper  depicted on the left needs to withstand typhoon winds and earthquake tremors common in its area of the Asia-Pacific. For this purpose, a steel pendulum weighing 660 metric tons that serves as a tuned mass damper was designed and installed atop the structure. Suspended from the 92nd to the 88th floor, the pendulum sways to decrease resonant amplifications of lateral displacements in the building caused by earthquakes and strong gusts. Seismic design is based on authorized engineering procedures, principles and criteria meant to provide seismic fitness of structures subject to earthquake exposure. Those criteria are only consistent with the contemporary state of the knowledge about seismic fitness of structures. Therefore, a building design which exactly follows seismic code regulations does not guarantee safety against collapse or serious damage. The price of poor seismic design may be enormous. Nevertheless, seismic design has always been a trial and error process whether it was based on physical laws or on empirical knowledge of the [wikiversity:[seismic performance|structural performance]] of different shapes and materials. UN headquarters in Haiti shows the devastation caused by the earthquake measuring 7 plus on the Richter scale which rocked Port au Prince on January 12, 2010. Seismic design requirements depend on the type of the structure, locality of the project and its authorities which stipulate applicable seismic design codes and criteria. For instance, California Department of Transportation's requirements called The Seismic Design Criteria (SDC) and aimed at the design of new bridges in California incorporate an innovative seismic performance based approach. During the 2011 Fukushima I Nuclear Station accidents in Japan, three nuclear reactors were damaged by explosions. Construction of Pearl River Tower X-bracing to resist any earthquakes and winds. Design and construction are intimately related. To achieve a good workmanship, detailing of the members and their connections should be, possibly, simple. As any construction in general, earthquake construction is a process that consists of the building, retrofitting or assembling of infrastructure given the construction materials available. Story Performance Rating R  may be used as a fundamental criterion of seismic fitness: R = v/ve where v is an actual or calculated inter-story drift and ve is a drift at the assumed elastic limit of deformation . The ultimate allowable value of R will occur when R = Rw = vu/ve where Quality Factor Rw is understood as the ratio of the ultimate allowable story drift vu that can be tolerated by the structure without a collapse to the maximum elastic story drift ve. Ratio R/Rw called a Seismic Performance Ratio controls the anticipated losses due to a seismic exposure. It is not the sole possible measure of seimic performance. However, in a majority of cases it is the most important one which would determine the Damage Ratio D.R. How to relate physical damage to economic losses may constitute a separate topic. Meantime, as the first degree of approximation, the following formula may apply: D.R. = 0.3 (R/Rw) 100 %. The formula demonstrates that when R/Rw (the current building standards' moment of truth: Demand equals Ultimate Capacity), D.R. = 30%. When R value reaches 1.5 Rw, the building's losses approach its replacement value. There is, also, the Damage Ratio Charts Method which is based on a consistent quantitative analysis targeting a prediction of damage ratios and employs a limited number of well-understood structural and earthquake related parameters. It establishes a direct theoretical relationship between the standard structural design procedure and the expected damage characteristics required by insurers. EPETO or Earthquake Performance Evaluation Tool Online  is the educational earthquake engineering internet site developed to facilitate potential users' performance and to expand variety of buildings, earthquake exposure and types of seismic control devices for determination of those buildings' seismic fitness. It has been successfully tested during July-August 2010 and is ready for public use without restrictions. The project may be accessed by clicking on EPETO: Operational scenarios. This site is a continuation of the recent research (NSF Award No: CMS-0618183)  which gave rise to a non-commercial release of the innovative software called Earthquake Performance Evaluation Tool or EPET . Valentin Shustov (2011), "Earthquake Performance Evaluation Tool Online," https://nees.org/resources/epeto. ↑ Valentin Shustov (2012), "Seismic fitness: on some features of earthquake engineering," http://nees.org/resources/4469/download/Seismic_fitness.pdf. ↑ Bozorgnia, Yousef; Bertero, Vitelmo V. (2004). Earthquake Engineering: From Engineering Seismology to Performance-Based Engineering. CRC Press. ISBN 978-0849314391. ↑ Berg, Glen V. (1983). Seismic Design Codes and Procedures. EERI. ISBN 0943198259. ↑ Earthquake simulation at the National Prevention Center. ↑ Valentin Shustov (2011), "Earthquake Performance Evaluation Tool Online,". ↑ Omori, F. (1900). Seismic Experiments on the Fracturing and Overturning of Columns. Publ. Earthquake Invest. Comm. In Foreign Languages, N.4, Tokyo. ↑ Clough, Ray W.; Penzien, Joseph (1993). Dynamics of Structures. McGraw-Hill. ISBN 0070113947. ↑ "The NIED ‘E-Defence’ Laboratory in Miki City"]. http://www.bosai.go.jp/hyogo/ehyogo/. Retrieved 3 March 2008. ↑ a b Chu, S.Y. ; Soong, T.T. ; Reinhorn, A.M. (2005). Active, Hybrid and Semi-Active Structural Control. John Wiley & Sons. ISBN 0470013524. ↑ Valentin Shustov (2010), "Testing of a New Line of Seismic Base Isolators". ↑ Elevated Building Foundation and Earthquake protector: new features in passive structural control. ↑ Zayas, Victor A. et al. (1990). A Simple Pendulum Technique for Achieving Seismic Isolation. Earthquake Spectra. pp. 317, Vol.6, No.2. ISBN 0087552930. ↑ Lindeburg, Michael R.; Baradar, Majid (2001). Seismic Design of Building Structures. Professional Publications. ISBN 0943198232. ↑ Housner, George W.; Jennings, Paul C. (1982). Earthquake Design Criteria. EERI. ISBN 1888577525. ↑ Edited by Farzad Naeim (1989). Seismic Design Handbook. VNR. ISBN 0442269226. ↑ Arnold, Christopher; Reitherman, Robert (1982). Building Configuration & Seismic Design. A Wiley-Interscience Publication. ISBN 0471861383. ↑ Robert W. Day (2007). Geotechnical Earthquake Engineering Handbook. McGraw Hill. ISBN 0713778294. ↑ Edited by Dr. Robert Lark (2007). Bridge Design, Construction and Maintenance. Thomas Telford. ISBN 0727735934. ↑ A CONCEPT OF DESIGN CODE FOR SEISMIC PERFORMANCE. ↑ Shustov, V. (1997). Future Seismic Codes and Earthquake Insurance, Proc. 66th Annual SEAOC Convention, San Diego, CA. SEAOC. This page was last edited on 27 August 2018, at 14:32.